Perez Party of 8: Love em! I have been really trying to figure out what would be the best plates & silverware to start using with the quads. Yes, I did put a lot of thought into this because 1. i was going to be spending the money X4 on them. 2. I wanted them to be worth the money I was spending. and 3. I REALLY wanted what I felt was going to "work" for my kids & their developing needs. So for those main reasons and others, I chose these from Gerber. I love the fact that you get it all in one package. It comes with a plate (that can be suctioned down), a rim to snap on top of the plate to better help them "scoop" up the food without it falling off the plate, and last, a BIG grip fork & spoon. * No Gerber did not ask me to do a product review for them, I found them on my own. The kids love them, and I didn't even have to use the suction part of the plate. The spoon & fork were PERFECT! In my opinion anyway. I really thought they would have trouble using them, but BOY was I wrong. They took to them like they had been using them forever! I like that the handle is short & chunky, and the fork is rounded on the edges, instead of being pointy. 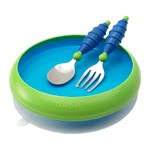 So if your kiddos are at that stage where they are getting ready for utensils or even a great baby shower gift, check these out! Will post pics of them using them soon! SO glad you posted this... I have been trying to find some that I like as well!! Going to see how they work for us! Thanks lady!